However (and here is the rub), I'm ticked at your ticketing system (kinda funny this play on word :-) about how it interacts, or most likely does not interact with our corporate travel department. See, I have an upcoming opportunity to travel coast to coast one week after another. When I submitted my two travel requests to fly Delta, Corporate kicked it back saying that Delta is more expensive ($200 and $300 more) than Virgin on one and AA on the other. Grrr, you don't fight Travel in these economic times. And...well I kinda wanted to try Virgin as I heard so much about it, but AA, no way! Had to admit defeat and take what was given to me, and then I started thinking. I do travel on one of these submitted trips very often and Delta _must_ know this. They _should_ have "bent" a little on the price for my business. I've been reading "Free: The Future of a Radical Price" by Chris Anderson (BTW, you can get his book for free) and I'm not saying I have to fly for free, but hear me out. What if you offered a free system that allows corporate travel departments to enter my frequent flier number, my upcoming trips, and (here is the important part) a form of a bid for these trips. In my case, $200 and $300 dollar less that the "list" price. You, given my history and preferences, can look at me "holistically" and can accept that bid. Propose something that is close, say within $40, the "bend" which Travel will accept the difference, after all they _are_ trying to accommodate me. Or you can totally reject the bid. What I mean by holistically, is that in today's world of data mining from me (you have over 10 years worth of travel info on me), my fellow travelers and other external information, you _should_ be able to determine a price point (even at a _small_ loss today) that is acceptable to both parties, as you _will_ make it up and be profitable later. I'm sure somewhere in the bowels of your IT department you are brewing something like that. If not, then you should look at these recommendation engines (like what Amazon and Netflix has) for your frequent fliers. Anyway, this advise is free on the hope that such a holistic system will exist. Looking forward to traveling with you when the price is right to Corporate. You can download the zip file from here, and you can see the application in action here. And like usual, the source code is here. 10/10/09 - I've updated the source to be a bit more robust - BTW, this only handles polygon shapes. A customer emailed me asking me how to create a horizontal map slider using the Flex API for AGS. The Map component has a property navigationClass to enable users to define a custom navigation class. In this sample, I defined a reference to the class com.esri.sample.MyNavigation which is a subclass of the Navigation class. * Override the order of the components. In the constructor, I defined the box direction (note the mx_internal :-) and my own custom slider. In addition, I've overwritten the addZoomInZoomOutComponents function to specify the order of the in/out buttons. Lastly, I defined a custom navigation slider to ensure the direction is horizontal. Here is the final result, and like usual the source code is here. 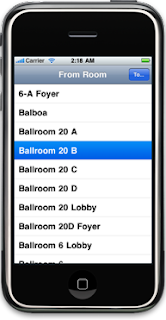 Not sure if some of you have see the 3D in-door routing application that I did for the ESRI 2009 User Conference. I used Papervision3D for this app, and was a lot of fun to develop. 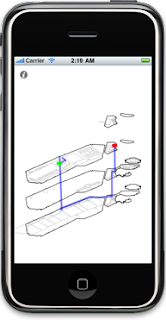 A couple of weeks before the conference, I decided to implement the same app on an iPhone using Obj-C. Being a newbie in the latter, I ramped up quickly on the language (got quickly over my hang ups on bracket, and kinda like the language :-). I started to look at the 3D built-in engine that uses a derivative of OpenGL and thought that I will not have the time to get this up and running. So I started to look for simpler alternatives. I read Keith Peters' most excellent AdvancED ActionScript 3.0 Animation book and used his A* implementation for client side routing application with barriers. check it out here. The next chapter in the book is all about isometric projection. This is exactly what I needed, an isometric view of the CDCC floors and rooms with a small twist, where the user can rotate the view. So before doing a full Obj-C dive, I prototyped my application in Flex/AS3. The idea was to read a 3D shapefile (thanks Edwin), apply a rotation matrix on the original coordinates and then pass them through Peters isometric utility class. Once debugged and got it up and running (check out the app here, hold and drag the mouse to rotate the view), I ported the code to Obj-C. Check out this post to see some iPhone app snapshots. Like usual, here is the source code of the flex app. Linear Grid: This app shows a linear grid distance (miles, km etc) on a geographic map. Zoom In; pan north and south;change the number of grids;etc. Notice the grid width displayed. Also change the units. Graticule: This app shows a Lat/Lon graticule in a web Mercator map. Zoom in continually. Notice how the graticule adjusts. SimpleGraticule: This app shows a Lat/Lon graticule in a Geographic map. Zoom in continually. Notice how the graticule adjusts. Quad Tree: This app shows a quad tree component that can index and search points in a client app. Add a bunch of points (Pick add 10K points). Drag the mouse to search. Try adding 10K more. Search again. The app shows you how the indexing is done. 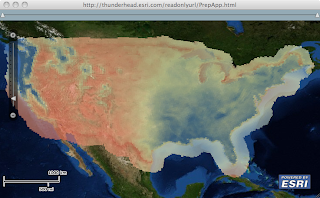 Polynomial transformation: This app shows how to warp any image and overlay it on a map. (polynomial transformation) Press show resulting image. Change the order to 2. The user selects common points from both left and right. I’ve preloaded the app with a bunch of common points. And last my 3D app. It’s similar to using the contouring app. MGRS: For the MGRS app, pan around the map by dragging your mouse. Of particular interest is the north pole, as most people leave off these zones, and they don’t draw curves. 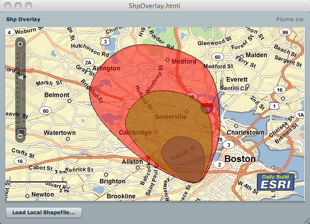 If you zoom out, the scale dependency of the MGRS Layer turns off the finer grids. (MGRSLayer is implemented by extending Layer and implementing updateLayer()). The curves are drawn by doing the following algorithm: I don’t brute force it and add a trillion points and then project. To draw a line I project the 2 endpoints to pixel locations, and then project the mid point to its pixel location. I then compare the mid point’s projected pixel location to its pixel location by averaging the two endpoints. If the locations differ by more then one pixel…I do this to both halfs. This algorithm is done “logically” recursively…but I set a limit as to how many midpoints I add. 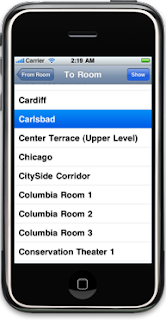 Yes - just finished a native iPhone application (not using Safari) that uses the ArcGIS Server REST endpoint to create a 3D path between rooms in the San Diego Convention Center for the 2009 User Conference - this is _not_ an officially endorsed application (Yet :-) but for me, it was a great experience to see if I can get the iPhone to connect to AGS and render the result path in 3D as vector graphics. Yes, vector graphics - this is _not_ an image - if you drag your finger across the screen, the SDCC floor will rotate to give you a different perspective of the path. Cool eh ? Will be showing up at the UC on Monday, so stop by the Flex booth if you wanna see it live and have an AR version on the browser - AR you ask ? Just stop by :-) Here are some screenshots of the app - looking forward to seeing a lot of u there. We are proud to release the 1.2 version of the flex API for AGS - check it out here. New stuff include the support for Virtual Earth map tiles and geocoding. There is also now support for Network Analyst routing/sequencing with time windows and lots of bug fixes and enhancements. Hope you all like it. As promised - just finished my presentation and here it is - have fun. Oh, here is the abstract: In this session we will demonstrate the Flex Mapping API For ArcGIS Server, where we will deconstruct live real-world mapping applications and algorithms such as dense clustering, auto labeling of features, collaborative editing, real-time asset tracking and client/server collaborative Geo-Processing. In addition, we will demonstrate how to create your own layer, geometry and symbol extensions for superior rendering performance taking advantage of the FP10 drawing API. Here is yet another clustering application. This is very similar to GeoCubes. It is based on a simple but effective algorithm, where the map extent is divided into "cubes". Given a map point from a set, the associated cube that it lies above is selected and the cube internal count is incremented. After processing all map points, the set of cubes with an internal count greater that one are displayed. Here is the application in action. And like usual, the source code is here. Just finished reading Keith Peter's ActionScript 3.0 Animation book, and I very highly recommend it. Chapter 4 is all about pathfinding using A* but is based on a tiled grid network. So I adjusted it, in such a way that the nodes and arcs are derived from street features off a shapefile. The resulting application enables you to select a starting and ending street intersection and a path is displayed. In addition, you can add street barriers so that the calculated path will go around the defined barriers. The nodes and arcs are spatially indexed. This enables live reverse geocoding as the mouse moves - that means that once the mouse is close enough to a street segment, a snap point is calculated and based on the side of the street, an interpolated address is calculated and displayed. Check out the application here, make sure to zoom in to enable snapping and path finding. Again, once you move close enough to a street segment, a snap point is displayed and the address is displayed on the top right corner. You can type the 'x' character to toggle the street as a barrier. Upon a mouse click, the closest node is selected as a starting node. Next, move the mouse to another node and click, and a path is displayed. The last selected node is now the starting node, click again and a path is calculated and displayed. Type 'C' to clear the resulting path. Like usual the source code is here. Have fun. PS: People have reported some drawing issues :-( that have been resolved if you use FP10. A colleague of mine asked me if there was a way to put arrows at the end of drawn polylines. My answer was "Not out of the box directly :-( but you can create your own line style subclass :-) And here is an implementation in action. Check out the source code here. While in Redlands last week, I was working with a client on how to create a heat map of an annual precipitation data over the US. He had about 11.5K map points with precipitation values and wanted to render this data very efficiently on the client browser using the new Flex API and wanted to have control over the rendering criteria. We loaded the data onto SqlServer and fronted it with WebORB (since he was a .Net dude, I'm a Java dude and would have used BlazeDS) to enable RemoteObject interaction. The idea here is to bulk load the data using SQL onto some structure and AMF it to the client. On the client side, we take advantage of that structure and use the Flash graphic primitives to render it. Turn out the most efficient structure is composed of 3 arrays holding the x, y and precipitation values. Since on the client we did not need to interact with each value, I created a custom layer that sub-classes Layer to render the 11 thousand values on a bitmap, and then the bitmap is rendered as a layer. Each value was rendered as a rectangle whose size varied based on the map scale and was filled with a color proportional to its value. Actually, we did modify the code a bit to have interaction with the values as the mouse hovers over an area (post for another day :-) We added a slider with two thumbs on top of the map to restrict the rendering of the precipitation values to the range between the thumbs, all client side. We enabled live dragging and the result was very cool. Check it out for yourself here. The version that you are looking at downloads the 11K map points from a shapefile (exercise for the reader to make it an RO :-) and like usual you can download the source code from here. Thanks Eric for sharing the data and code snippets. I just got accepted to speak at 360|Flex Indy! The show will be going down May 18-20, 2009. You can check out the other great 49 speakers on the schedule at: http://360conferences.com/360flex/downloads/schedule.pdf It's looking like it's gonna be another great 360|Flex conference, especially with yours truly speaking. Tickets are cheaper on a first come, first serve basis! So buy your tickets asap at http://360flex.eventbrite.com to get the best possible price. See you there and you better go to my session! 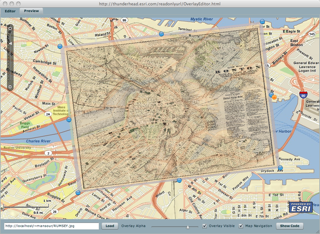 Found a historic map of Boston collected by David Rumsey, and thought it would be nice to be able to put this map on a current map. As the image needs to be scaled, rotated and translated, I wrote a custom symbol (OverlaySymbol) to enable the scaling, rotation and translation when the map extent changes. So all that is cool, but the problem was coming up with OverlaySymbol properties. So I wrote the OverlayEditor application that enables you to load the image and using a instance of Flex Object Handles, you can stretch, move and rotate the image. Once you are satisfied with the parameters, you can view the source code of a sample application that you can save and compile with a reference to the OverlaySymbol.as code. You can check out the application here. You can load an image of Mount Etna in Sicily. And like usual you can download the source code from here.